ASTERIOS is way more than an innovative Real-Time Kernel (RTK). It does come with an efficient micro-kernel and some services, which are carefully implemented and optimized to offer the best performances and safety guarantees. But it turns out the RTK constitutes only a small part of the code base that we maintain at KRONO-SAFE. Beyond the original Integrated Development Environment and the simulation and debugging tools, ASTERIOS offers a rather unique multi-task, parallel Real-Time Programming Model that we call Psy (as in Parallel SYnchronous: no link with Korean pop music whatsoever). This model enforces several safety-oriented properties; and in order to actually write applications that comply with this model, we’ve come up with a dedicated programming language, built upon the legacy C language, and that we’ve called Psy-C. This post is about the properties of our Programming Model, and the benefits we see in designing real-time applications in Psy. conversely, in a time-triggered system the observable state of the system can only change at specific, physical dates, which are known prior to execution. Because the driver task is only executed periodically, the system designer knows in advance the exact CPU load required by the driver task. Noticeably, it means that the system cannot be overloaded by an interrupt storm, which is one of the oldest concerns when it comes to safety of real-time systems. The induced latency actually also gives an upper-bound of the longest time that can elapse before an input is taken into account, since the driver task will run exactly once every 10 ms. In addition, the fact that the observable state of the system (namely the interpreted position of the pointer) can change only every 10 ms eases reproducibility, thus making the system easier to test. 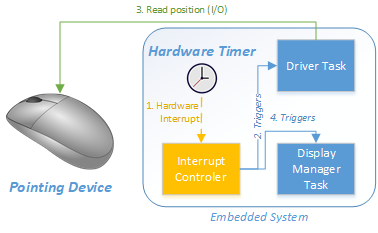 The Time- vs Event-Triggered war goes one for some decades now in the world of embedded real-time systems; the truth being of course that both models have their advantages and their drawbacks. The event-based approach is considered to be better suited for non-critical, low-latency real-time systems, whereas time-triggered designed systems offer better reproducibility and determinism. Thus, at KRONO-SAFE, we’ve tried to take the best of both worlds: the roots of the Psy programming model are Time-Triggered, and we’ve built some extensions to allow to some extent the intervention of external event with low-latency. In this post, we’ll focus only on the time-triggered approach used in ASTERIOS, and the key benefits it provides. The Psy programming model is parallel and multi-task, meaning that an application can be made of several execution threads, that are executed simultaneously. A sequential execution unit is called an Agent, which can be seen as a real-time declination of a UNIX process. a CPU budget, basically the actual CPU time granted to complete the execution of the aforementioned set of instructions. Allow us to emphasize the fact that, with respect to the time-triggered principle, there can be no additional constraint on the execution of an E.A: it can be executed if and only if ESD < = t < Deadline, where t is the current physical time. There can be no additional synchronization: the task cannot be blocked waiting for a lock, or waiting for an external interrupt other than the timer tick that marks the Earliest Start Date. We have just seen that, when defining an Elementary Action, the developer has to specify two time duration: the E.A. span, and the CPU budget provided to execute the code of this E.A. This may come as a surprise at first: in fixed priority systems for instance, the developer usually tends to worry only about the execution time (that is, the CPU budget) of each job. But we precisely believe that this is the source of lots of misconceptions and poor design choices of hard real-time system. There is a fundamental semantic difference between the span of an E.A and the CPU budget. The span of an Elementary Action is set by a functional requirement, whereas the CPU budget is an entirely target-dependent value, that should be greater than or equal to the worst-case execution time (WCET) of the set of instructions to be executed. One last note regarding the evaluation of WCETs: several industrial-grade tools are entirely dedicated to the evaluation of WCETs, and ASTERIOS Developer does not aims at becoming one of them. We do provide however profiling tools to reasonably estimate CPU budgets of each Elementary Action, based on multiple executions on target – but that’s for another post. Let us proceed to the unsurpassable horizon of any embedded system development, using the ASTERIOS programming model: let’s make a LED blink! Necessary disclaimer: this example is not as ridiculously naive as it seems – besides you can easily transpose it to a number of textbook Instrumentation & Control functions (PWM regulation for instance). So, suppose our Software Requirements Specifications (SRS) states that “The LED shall blink periodically, with a period of 10 ms and a duty cycle of .5“. In layman’s terms, the LED shall be half-time on, half-time off, every 10 ms. In that case, the LED will remain on almost all the time; other scheduling policies could also lead the LED to be off all the time. Little to say that the requirement is not satisfied. And that would actually be the right approach. Notice how the switch_on() and switch_off() calls have been encompassed in smaller Elementary Actions. The SRS should have specified the span of these time windows. To be more precise, the specification fails to define the acceptable jitter for switching the LED on and off: there is no such thing as “instantaneous” in any physical system, and the specification should definitely take this into account. the LED shall be switched off between 5 and 6 ms. The total CPU time needed to switch the LED on resp. off shall be monitored and not exceed 500 microseconds. Some additional requirements should be provided to specify the behavior in case one of these constraints cannot be met during execution (health monitoring). A common mistake when tying to refine this specification is to state that the LED should be switched on and off “as soon as possible” after t=0 and t=5ms. First of all, this requirement is only partial: it fails to specify a deadline, i.e. a date after which, if the LED has not been switched, an error should be raised. However, on a system where this task is the only one to be executed, “as soon as possible” may seem a reasonable requirement. Yet, this “best effort” approach is a bad idea for scalability: when adding a dozen of new tasks to the system, “as soon as possible” implies priorities between tasks. Although this approach is formally correct, it turns the issue into a static scheduling problem for the programmer. ASTERIOS Developer precisely allows to avoid the static priorities nightmare by providing an automatic offline scheduler for PsyC applications – but that’s for another post. We hope to have shown with this apparently naive example, that specifying a “hard” real-time behavior actually requires more than it seems; and we believe that the Psy programming model is the right way to do it. The Psy programming model forces the designer to fully specify the temporal behavior of the tasks (Earliest Start Dates, Deadlines, CPU budgets), which can then be implemented in PsyC in ASTERIOS Developer. In this post we have only scratched the surface of the possibilities and the expressiveness offered by the Psy Programming model and the time-triggered approach. 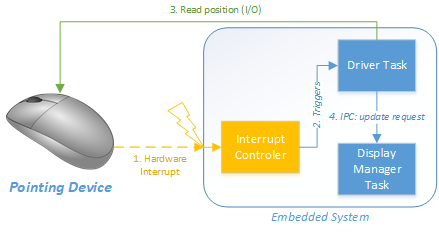 Among other things, it enforces deterministic communications (as we’ve shown in a previous post), it enables reproducible simulation on workstations, and it ultimately greatly facilitates porting an application for a target hardware to another – even multi-core. In the upcoming posts, we’ll illustrate the expressiveness of the PsyC language, and the complex temporal behavior that you can describe with ASTERIOS while still preserving determinism and reproducibility.